Be the first to share your favorite memory, photo or story of Leander. This memorial page is dedicated for family, friends and future generations to celebrate the life of their loved one. 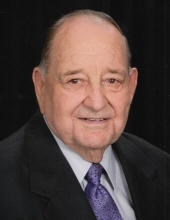 Leander F. Konz,95, of Remsen, Iowa, passed away on Wednesday Jan. 2, 2019 at Happy Siesta Health Care Center in Remsen. Mass of Christian Burial will be 10:30 a.m. Saturday, Jan. 5, 2019 at Holy Name Catholic Church in Marcus with Father William McCarthy officiating and Deacon Rick Roder assisting. Burial will follow in St. Mary’s Cemetery in Remsen, IA. Graveside military honors will be conducted by V.F.W. Post 3328 and American Legion Post 220 of Remsen. Visitation with family present will be 4-7 p.m. Friday at Fisch Funeral Home & Monument in Remsen. There will be a parish rosary and vigil prayer service all at 5 p.m. at Fisch Funeral Home & Monument in Remsen. Visitation will resume from 9-10am Saturday at the funeral home. Lee was born on Feb. 20, 1923, in Alton Iowa. He was the son of Joseph and Emma (Mousel) Konz. He attended St. Mary’s Academy in Alton, Iowa. Lee served in the U.S Army from Jan. 1946 to Nov. 1946. On Dec. 11, 1945 he married Jane Arens at St. Mary’s Catholic Church in Remsen. They farmed north of Remsen until 1991, when they retired and moved into Remsen. He was a member of St. Mary’s Catholic Church in Remsen and Knights of Columbus. He enjoyed playing cards, driving his Combine, reading the encyclopedia, fishing, hunting and bowling. His family was extremely important to him. He lived by the words, Respect, Be Kind and I Love You. He was grateful to share his life with his wife of 73 years, Jane of Remsen; his 10 children, Connie Kneip of LeMars, IA, Roger Konz of Chandler, TX, Bev (Ron) Haverly of Cumberland, WI, Darlene (Justin) Cavey of Schofield, WI, Carl (Joanne) Konz of West Des Moines, IA, JoAnn (Scott) Eischeid of Roscoe, IL, Jim (Ann) Konz of Overland Park, KS, Joe (Barb) Konz of Nashville, TN, Tom (Laura) Konz of South Minneapolis, MN and Pat Konz of Altoona, IA; 29 grandchildren, 36 great-grandchildren; one sister, Ann Shea of Primghar, IA; one brother, Joe (Germaine) Konz of Granville, IA; sisters-in-law, Doris Wurth of Iowa City, IA, and Mary Ann Arens of LeMars, IA. He was preceded in death by his parents, son-in-law, Roddy Kneip, two sisters, Arlene (Milton) Galles and Margie (Marvin) Galles, one brother, Loyal Konz, Brothers and sisters-in-law, Don Shea, Lou Wurth, Jim Arens, Valeria (Lawrence) Alesch, Phylis (Martin) Englert, Helen (Ed) Jaminet, Mary (Gene) Loutsch, Esther (Leonard) Konz, Os (Doris) Arens and Kenny (Elvira) Arens. Casket bearers will be his grandchildren. Honorary Bearers will be members of the Knights of Columbus. To send flowers or a remembrance gift to the family of Leander F. Konz, please visit our Tribute Store. Visitation with family present will be 4-7 p.m. Friday at Fisch Funeral Home & Monument in Remsen. There will be a parish rosary and vigil prayer service all at 5 p.m. at Fisch Funeral Home & Monument in Remsen. Visitation will resume from 9-10am Saturday at the funeral home. "Email Address" would like to share the life celebration of Leander F. Konz. Click on the "link" to go to share a favorite memory or leave a condolence message for the family.